As Gabe Bouck enters Advent, a season in which Catholics are urged to answer God’s call for conversion, the seminarian is reminded of the melodic voice that inspired him to become Catholic. The former Baptist recalled attending his first Mass nearly six years ago where he encountered sounds he had never before heard in a church and it was coming from the priest. “The priest sung the entire Mass,” said Bouck, a first-year seminarian at Theological College, a national seminary at The Catholic University of America in Washington. This priest sang the liturgy in ethereal tones, mysterious sounds to the young Protestant with a musical background. He was used to music that came in more predictable forms with standard rhyme or meter. But the reverberations coming from the priest defied the musical logic Bouck had come to expect and it mesmerized him throughout the Mass. Bouck hadn’t realize he’d encountered Gregorian chant. He did realize at that moment that he wanted to become Catholic and the sounds he deemed mystifyingly beautiful called him to conversion. Gregorian chant is a monadic and rhythmically free liturgical chant considered the official music of the Catholic Church. Not to be confused with liturgical hymns and other sacred music, Gregorian chants are typically unaccompanied sung prayers and official texts of the liturgy and congregation responses. When the priest is singing portions of the Mass and the congregation sings the response, they are practicing a form of Gregorian chant, said Timothy S. McDonnell, director of the Institute of Sacred Music at The Catholic University of America. 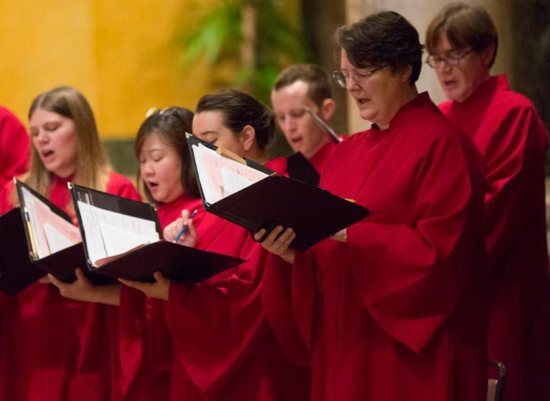 Choirs in some Catholic churches also sing Gregorian chant, both in Latin and English, as part of a repertoire that may include other sacred music. Though documents from the Second Vatican Council gives Gregorian chant — developed between the seventh and ninth centuries in the Diocese of Rome — pride of place in the Mass, it’s no longer the dominant sound in most Catholic parishes, McDonnell told CNS. Gregorian chant was largely replaced by more vernacular music following Vatican II, when the traditional Latin Mass was changed to the dominant language of each country. However, Gregorian chant began to regain popularity in the 1990s and some Catholic parishes began reintroducing it during worship. Bouck believes it was no mistake that he happened to attend his first Mass where the priest celebrated it completely in Gregorian chant. Once he settled into parish life at the Catholic Church of the Ascension in Memphis, Tennessee, Bouck joined the choir and eventually became its director. Bouck’s music ministry and involvement in the church would eventually lead him to consider the priesthood, a vocation he is now seeking in seminary, where he offers his considerable singing talents in the school’s schola. It’s not uncommon for someone involved in a music ministry to hear the call to the priesthood, said David Lang, music director of Theological College.